We recommend checking out our discussion threads on the TomTom Bandit Action Camera (Premium Pack) 1LB000101, which address similar problems with connecting and setting up Sports & Action Cameras TomTom. The user manual for the TomTom Bandit Action Camera (Premium Pack) 1LB000101 provides necessary instructions for the proper use of the product Camcorders - Sports & Action Cameras. The TomTom Bandit Action Camera offers a smarter way to record, edit, and share your skills and adventures. It records up to 4K (Ultra HD) resolution video at 15 fps, 2.7K at 30 fps, and 1080p at 60 fps. It also supports 720p at 120 fps, 16MP still images in burst up to 10 fps, and 4K/1080p time lapse modes. Equipped with built-in GPS and in-camera sensors, the Bandit tracks your location, altitude, speed, and other data, which can be overlayed on top of your footage. This data is used to mark highlights within your footage so you can quickly find the most exciting parts. It even can track your heart rate when used with a compatible Bluetooth heart rate monitor. Featuring a built-in media server, the Bandit eliminates the need to download footage before being able to edit. Rather, you can edit footage directly on the camera itself, using a companion iOS and Android app to create and share videos quickly and intuitively. With a simple shake of your smartphone the app can even automatically assemble and create a ready-to-share highlight reel from your footage based on your highlight tags. For power, the Bandit has a removable and rechargeable 1900mAh battery that uses a standard USB connection, which makes it easy to plug directly into a computer or a USB charger without requiring any additional cables. The Batt-Stick, as TomTom calls it, is also where you'll find the microSD card slot, so connecting it to your computer also lets you transfer files. A fully charged battery provides around three hours of 1080p30 recording. This Premium Pack includes a wide range of accessories, including a splashproof lens cover for use around water or in light rain, and a dive lens cover for underwater shoot at maximum depths of 164'. Also included is a remote control with wrist strap for camera control in situation you might not want to bring your smartphone. Additional accessories include a power cable, a handlebar mount, 360° rotating mount, one flat adhesive mount, one curved adhesive mount, and a GoPro adapter for attaching to any accessory has a standard three-prong GoPro mounting interface. If you own a TomTom sports & action cameras and have a user manual in electronic form, you can upload it to this website using the link on the right side of the screen. Normal FOV Mode: 1080p and 720p only. 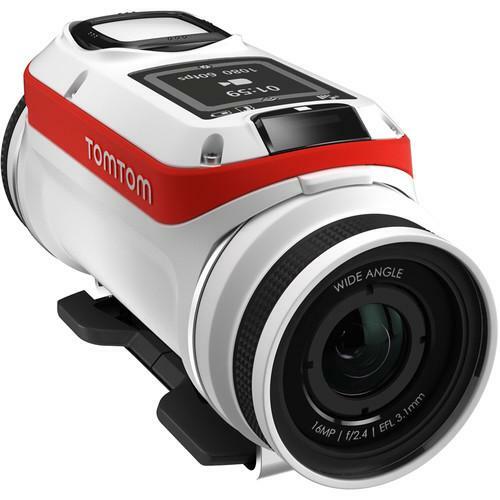 Box Dimensions (LxWxH) 7.1 x 5.4 x 5.1"
The user manual for the TomTom Bandit Action Camera (Premium Pack) 1LB000101 can be downloaded in .pdf format if it did not come with your new sports & action cameras, although the seller is required to supply one. It is also quite common that customers throw out the user manual with the box, or put the CD away somewhere and then can’t find it. That’s why we and other TomTom users keep a unique electronic library for TomTom sports & action camerass, where you can use our link to download the user manual for the TomTom Bandit Action Camera (Premium Pack) 1LB000101. The user manual lists all of the functions of the TomTom Bandit Action Camera (Premium Pack) 1LB000101, all the basic and advanced features and tells you how to use the sports & action cameras. The manual also provides troubleshooting for common problems. Even greater detail is provided by the service manual, which is not typically shipped with the product, but which can often be downloaded from TomTom service. If you want to help expand our database, you can upload a link to this website to download a user manual or service manual, ideally in .pdf format. These pages are created by you – users of the TomTom Bandit Action Camera (Premium Pack) 1LB000101. User manuals are also available on the TomTom website under Camcorders - Sports & Action Cameras.